· Meeting (call) times will be the same as before – see below. However, we will try to accommodate another time, if there are sufficient requests. · Format – we will use the same format as last year: A weekly conference call using free UberConference with approximately 1 hour for each call. Participants will, if possible, take turns identifying 3-5 questions for each session that will be submitted 3 or 4 days before the upcoming session. Participants on the call are mindful to allow appropriate time for each person to speak. Participants will each obtain their own book. Also, we will limit the number of participants in any group to 12. · Book Selection – after receiving over 25 suggestions from book group participants, we have listed two books to choose from – see below. Please choose your preferred book between these two. We will correlate the books chosen with the respective group, i.e., if, arbitrarily, there are 12 people in the Sunday group and 4 choose book A and 8 choose book B, we will go with book B for the Sunday group. We realize this could mean that you might want to change to a group that selected the book you prefer. This is not a perfect arrangement, but we will do our best to accommodate as many as possible. Note: ORBIS BOOKS provides a 40% discount to all Affiliate Book Group participants. Just mention "Maryknoll Affiliates". · Expanding the participants – Please forward this notice to your Chapter, friends, parish community, etc. if you wish to invite them. ______Tuesday – 11:00 am ET....etc. Orbis offers a 40% discount to Affiliate Book Club members. 4. If there are more than three Book Groups are you willing to be a group organizer? ______ yes or no? It’s November—time to ask you to help support our 2017 Affiliate Operational Budget. Remember, the Affiliates are funded cooperatively by the Maryknoll Fathers and Brothers, Maryknoll Sisters, Maryknoll Lay Missioners, and us. We Affiliates pay for Executive Coordinator travel, printing, website technical assistance, and other day-to-day expenses, such as paper clips and rubber bands. The other Maryknoll expressions fund the salary and benefits of our Executive Coordinator. Without their steadfast commitment to the Affiliate movement, we would not be. For the fifth year in a row, our fund raising effort has met and surpassed our operational budget goal of around $22,000. We have been fortunate to receive several large gifts, including investment distributions and estate bequeaths. We are most appreciative of all contributions, but we hope to develop a diverse donor base. A generous donation came from the Seoul Korea Chapter. While we do not actively solicit donations from our international chapters, we appreciate their desire to fully participate in the Affiliate life. . 감사합니다 – Thank you! Our gift to you is the enclosed bookmark for the MAC2017 Conference hosted by the Guatemala Chapter. We will be at the beautiful retreat house and grounds at Casa de Retiros Verbo Encarnado, in the mountains above Guatemala City, from Thursday through Sunday, November 9th the 12th. Post-conference, we will have the opportunity to visit Maryknoll missions in the area. Two Guatemalan Affiliates came to our fall Board meeting with a preview of the planned program. The theme, “¡Buen Vivir!—To Live Fully,” will be joyously fulfilled at the conference. Many of you are already planning to attend, and ideally every chapter will have a representative at MAC2017. Has your Chapter looked at ways to help make that happen? To encourage broad attendance, the Affiliate Board approved a travel grant program made possible by your generosity. Details on MAC2017 and travel grants will be available after the first of the year. As I read the stories of Affiliates in Not So Far Afield and No Tan Lejos del Horizonte, I am moved by the actions of Affiliates “…out in the streets…” From Claudia Samayoa, tireless fighter for human rights in Guatemala, and Renate Schneider, working with the poorest of the poor in Haiti, to Affiliates championing a local food pantry, interfaith dialogue, or help for Alzheimer’s caregivers, all are witnesses to an outward facing church, not one clinging to its own security. We need your financial contribution to the Affiliates to provide a communication network where you can connect. Through the website, newsletters, and the executive coordinator’s efforts, you can share your experiences, ideas, invitations, and concerns with the larger Affiliate community. Ideally, all Affiliates will contribute, as they are able. The enclosed giving form offers alternatives: a one-time donation or periodic contributions, either from a checking account or by credit card. We urge you to contribute today. However, if you are unable to make a monetary contribution at this time, you can always help through prayer and volunteering your time and talent. Please make check payable to the Maryknoll Fathers and Brothers and write Maryknoll Affiliates Annual Appeal in the memo line of your check. You can have donations directly charged to a debit card or credit card or debited from your checking account on a monthly, bimonthly, quarterly, semi-annual or annual basis.  YES! I would like to make regular automatic transfers to Maryknoll for the Maryknoll Affiliates 4014 Mission Account using my credit or debit card in the amount of $ __________. Should I decide to cancel, I will call Maryknoll. I understand that my donations will be recorded on my statement, which will serve as my receipt.  YES! I would like to make an automatic transfer from my bank account to Maryknoll for the Maryknoll Affiliates 4014 Mission Account in the amount of $ __________. Should I decide to cancel, I will call Maryknoll. I understand that my donations will be recorded on my bank statement, which will serve as my receipt. Please include voided check along with your donation. * If you are a new enrollee to Maryknoll Mission Direct, please enclose a check for your next donation. After that, your donations will be transferred to Maryknoll electronically. The eight new Maryknoll Lay Missioners of the Class of 2016 will be called and welcomed to their mission countries. The Lay Missioner Staff has extended a warm invitation to Affiliates. Driving into the Hudson Valley for our October board meeting, I saw the magnificent and glorious fall colors; seasons are something that elude us here on the California Central Coast. Though basking in the colors, my thoughts were muted by the news out of Haiti and particularly from Chicago Affiliate Renate Schneider. She works with various development projects in Jérèmie, one of the areas hardest hit by hurricane Matthew. came from Guatemala to report on MAC2017. This is the first truly international MAC conference—twww.verboencanado.com.gt/homehat is, taking place outside the US. The program presented to us by Rosa and Claudia wowed us. It is based on the Affiliate four pillars: Action: an opportunity to visit mission projects in conjunction with the conference; Global Vision: applying indigenous people’s ethos to our mission perspective; Community: sharing activities and socials to get to know our fellow Affiliates from around the world; and Spirituality: a particular emphasis on seeing God in all creation and in all peoples. The board has approved a travel grant program to encourage the broadest possible representation of the Affiliate Movement. Conference registration and information on the travel grant application process will be available after the first of the year. This MAC is going to be very special and I hope you will give serious and prayerful consideration to attending. MAC2017 happens Thursday, November 9th through Sunday, the 12th, at the beautiful Casa de Retiros Verbo Encarnado (http:// www.verboencarnado.com.gt/home) in the mountains not far from Guatemala City. Post-conference opportunities to visit mission projects will be offered. Other board actions were reported in the Monday email sent on November 7th. They include a continued focus on the three committees that were established to act on your responses to the Affiliate Survey of 2015: Communication, Sustainability and Growth, and Connection. These committees will be reporting to you in the NSFA, beginning in January, 2017. We attended to other organizational tasks that may seem pedestrian to an outsider but are vital to an organization: providing for replacement of members rotating off the board, updating our Roles & Responsibilities statements, revision of the Board Member Manual, reviewing our finances, and approval of budgets and expenditures. Did I mention that we’ll be 25 years old next year? In my short time as board chair, it is clear to me that it takes a small village to keep the Affiliate Movement moving. I thank my fellow Affiliates on the Board and our Regional Coordinators; and in particular our board members from the other three Maryknoll expressions: Sisters Norie Mojado and Teruko Ito – the Congregration, Marj Humphrey – the Maryknoll Lay Missioners, and Russ Feldmeier – the Society. Executive Coordinator Bob Short provides not only coordination, but wisdom and leadership. Eleanor Swanson serves as our recording secretary. And our major communication efforts, Not So Far Afield and No Tan Lejos del Horizonte, would not happen without Mary Ryan-Hotchkiss, Paula Schaffner, Rosa Beatriz Castañeda, and their editorial staffs. Of course the Affiliates would not be the Affiliates without the energy and spirit that all of you bring to all your missions. This week - November 3, 2016 - Claudia Samayoa, member of the Maryknoll Affiliate Chapter in Guatemala was given the Myra Mack Chang A. for her untiring work in Human Rights on behalf of the people of Guatemala. In the accompanying photo you can see Claudia receiving the award from, the Procurator General of Human Rights in Guatemala, Jorge Edwardo de León Duque. CAS #1: The Board approaches with an open heart the request of the Nairobi group to become a Chapter. To move this dialogue forward, Society and Congregation members in Kenya and Tanzania will be contacted. Bob Short will communicate with the Nairobi group to explain more about the Affiliate formation program and about our search for an accompaniment person. CAS #2: The Affiliates will continue the dialogue with a group in Mombasa concerning the possibility of its becoming a virtual chapter. In November, Bob Short will meet with group representatives to explore this possibility further. CAS #3. The Affiliates will allocate $15,000 - $16,000 to fund the travel grant program for MAC 2017. CAS #4. The Board approves the six revised Roles and Responsibilities documents presented, with the agreed-upon changes. CAS #5. The Board affirms the nomination of Manny Hotchkiss to the Affiliate Board. CAS #6. The Board agrees the three committees created at the April 2016 meeting – Communications, Connections, and Growth & Sustainability – should be reinvigorated. To this end Bob and Rich will communicate with the committee members concerning continuing work. CAS #7. The Communications, Connections, and Growth & Sustainability Committee chairs will submit articles for Not So Far Afield and No Tan Lejos del Horizonte concerning their work. CAS #8. Bob Short, Mary Massaro, Paula Schaffner, and Ginny McEvoy will revise the Affiliate Handbook to have a provisional updated Handbook by the Spring Board Meeting in May, 2017. Archival material will be transferred to the Maryknoll Archives. The team will also assess what additional material needs to be updated and how to proceed with updates. CAS #9. The Board approves the 2017 Affiliate Operating Budget. CAS #10. The Board commits to cover the possible shortfall of $7,400 if fewer than 60 people from outside of Guatemala attend the MAC. The number is based on the fact that 40 people have so far indicated their intent to attend. The Board enthusiastically received the MAC2017 report, expressing wholehearted support of the conference plan, and deep appreciation to Rosa Beatriz Castañeda, Claudia Samayoa and all involved. I copied the message below from something my affiliate friend Beth Begley sent out from Pax Christi. It's short. Most of you know that I have a very special feeling for the people of Syria, and especially the city of Aleppo, which I visited in 2008. The recent news photo of the little Syrian boy, 5 years old, bloodied and shell shocked, speaks volumes about the incredible suffering of the people there. 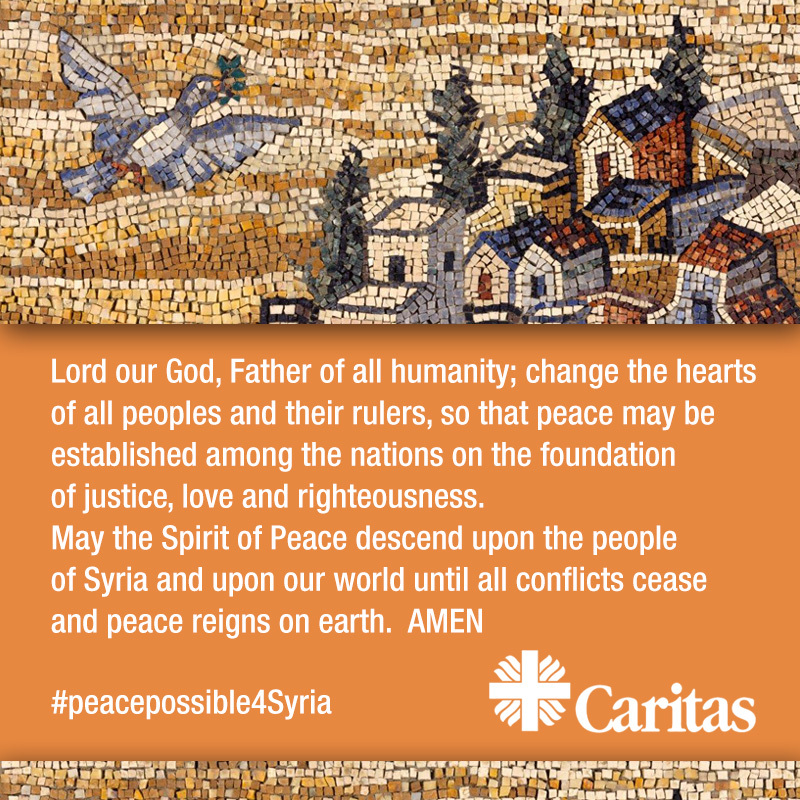 In July, Cardinal Luis Antonio Tagle, said, “We need a worldwide movement towards peace in Syria." On October 31, 2016, please join Pope Francis in prayer. Pope Francis will be saying a prayer for Peace in Syria at 3 p.m. in Sweden. Caritas International is inviting people of faith around the world to pray at that time (9 a.m. EDT) or at 3 p.m. local time—or any time that works. Here are links to the prayer and the overall campaign website. Click here to learn more about CRS’ work to address the needs of Syrians. Often it seems as if there is little we can do in response to crises such as these on an individual level, yet there is something very powerful about joining together in prayer for special purpose. That's why I ask you to join me in a prayer for Syria on Monday. A note to all of us from Renate just before she returned to Haiti. I am leaving for Haiti tomorrow, but did not want to leave without letting you know how deeply I have been moved by the Affiliates response nationwide. I am so proud to be part of that community. Please let all the Affiliates know that I am deeply grateful and will share their generous contributions with my people in Jeremie. I will be sending periodic updates. October 4, 2016 a devastating hurricane of enormous force, winds and torrential rains hit Jérémie and the greater Grand’Anse region. Nothing like this has ever occurred here before, the last hurricane was seen in 1954. Close to 90% of the smaller houses with tin roofs have been completely destroyed. Nobody escaped the devastation. Most people have lost everything, clothes, photographs, and what is more important birth certificates and other important documents. In other words, almost everybody starts at zero.Of course all lines of communication are inoperable, no electricity, no phone contact, no internet. So there is no way to find out if people are ok, or to let loved ones know nobody is hurt. Elections were to take place October 9, this coming Sunday, but the government already declared that elections will not take place. Another delay in a series of delays. Can Haiti ever move forward? As far as the work of Haitian Connection, it remains to be seen what can be salvaged. We are fairly sure that the houses we built so far could not withstand this hurricane. But there is no way to find out until the roads are passable. So far neither motorcycles nor cars are able to pass, since the roads are blocked by fallen trees. Newsflash just in: 3 houses we just finished building in a new community have withstood the hurricane and they provided shelter during the storm for a number of people. Thank God for small -- or rather -- large miracles. We have not been able to get out to the university campus, but have heard reports that the whole campus is under water from the swollen river nearby. The tin roofs of the classrooms are gone, swept up by the winds. For those of you who have come as volunteer professors to UNOGA, you need to know that the guest house is no longer. The old structure could not withstand the gale force winds. The 2nd floor simply collapsed onto the first floor, 15 minutes after Reginald got the two remaining professors out. We will need to close the university until January. The Southern Regional Affiliate Conference was held just outside of New Orleans in Metairie – September 30th – October 2nd.The Conference opened with a moving prayer and possession highlighting the four Affiliate pillars of Spirituality, Community, Action and Global Vision. For the remaining time, the diverse modes of presentation that followed spoke to the theme - Mission of Accompaniment: Walking Each Other Back Home. On Friday evening, the keynote, given by the always-dynamic Matt Rousso, employed Pope Francis’ apostolic exhortation Evangelii gaudium to develop the theme.He also regularly incorporated the wisdom from the group present to help concretely situate the theme of accompaniment in our own life experiences.Saturday morning opened up with an early morning Prayer Walk at the Lake (along the levy of Lake Ponchartrain adjoining the retreat ground where we were staying) followed by breakfast.Following breakfast, Jason and Felicia Gehrig, a former Maryknoll lay missioner couple who spent seven years in the Bolivian altiplano related their mission experience through a series of slides and very touching stories – some exhilarating, some heartbreaking and all somehow hopeful – that confirmed the importance of accompanying others wherever we find ourselves. That afternoon a panel with Russ Feldmeier MM, Gerry Kelly MM and Bob Short spoke to the Affiliate movement vis-à-vis, respectively: the Maryknoll Society, the Third Wave initiative and the present-day Affiliate movement.The interchange with the participants that followed was especially fecund.Before dinner that evening, Lindsay Doucette of the MKLM gave an expansive overview of her work in recruitment and also talked about how it could connect with Affiliate initiatives.Louisiana gumbo was served for supper and, by all accounts from those natives in the know, was authentic and delicious. The evening featured a New Orleans Fais Do Do (I had to look that up too) and talent show wherein participant adorned with French Quarter beads and holding frilly umbrellas made semi-embarrassing attempts to show off their “dance” skills as they marched around the serving counter. Matt lit up the evening with Cajun Humor (Boudreaux jokes) while members from the North Texas Chapter put on a skit to honor Saint Thérèse of Lisieaux, whose feast was celebrated on the day.The Conference ended on Sunday with announcements, an evaluation and a Eucharistic celebration. Somewhere in his writings, Saint Francis of Assisi wrote that the Lord “…wants me to be a new kind of fool in the world…” Just a few minutes into gathering together as Maryknollers – seeing how the New Orleans Chapter welcomed all of us, the global and local issues that consumed us (and the consumer issues that didn’t), the wholehearted laughter that filled us, and, maybe even the simple dress that clothed us – gave some evidence that we too were aspiring towards the new fool in the world classification. The advanced levels of insight, education, creativity and life experience don’t disqualify in this regard. It was a small group of just 30 participants, but it was clear from the start that we were connected by and committed to the Maryknoll charism of accompanying (at home and cross-cultural settings) those who have little or no voice in our clamorous, disjointed world. In Pope Francis’ Laudato Si’: On Care for Our Common Home, he said this of Francis of Assisi: His response to the world around him was so much more than intellectual appreciation or economic calculus, for to him each and ever creature was a sister united to him by bonds of affection. (¶ 11). That rings very true. Finally, although many of us hadn’t met before, we soon realized that we were at home together. New vocations are not flooding into any of the expressions within Maryknoll these days, but I couldn’t help but wonder if this would be reversed if new people – young or old – spent the weekend with us. Perhaps that’s wishful thinking. Minimally it couldn’t help but make heads turn and speed up the heartbeat a bit. Of course, for those not from that region of the country, the grits, biscuits and gumbo couldn’t hurt either. "Our beloved Father John Walsh, MM passed away this afternoon (Friday). He was a devoted member of the Long Island Maryknoll Affiliate Chapter for many years and was a resource for us since the beginning of the Affiliates. Fr. John spoke at the first MAC at Maryknoll, Ossining, and, with his expansive vision, was always supportive of Affiliates. He became a member of the LI Chapter when we met at the Father's house in Hempstead, NY and remained part of our group until illness necessitated his transfer to St. Theresa's." Please remember this good man in your thoughts and prayers. The United States Catholic Mission Association’s 2016 Conference will take place in the Cincinnati, Ohio region and is entitled: Together in Mission- Celebrating Concrete Expressions of Missionary Discipleship Yesterday, Today, and Tomorrow. 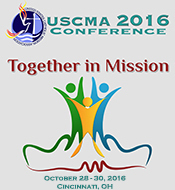 In honor of USCMA’s 35th Anniversary, the aim of USCMA’s 2016 conference will be to highlight the mission reality of US Catholics serving around the world and at home and reflect how these realities can help make our local communities a reflection of Jesus’ liberating spirit and how these expressions of mission will adapt in the coming years.